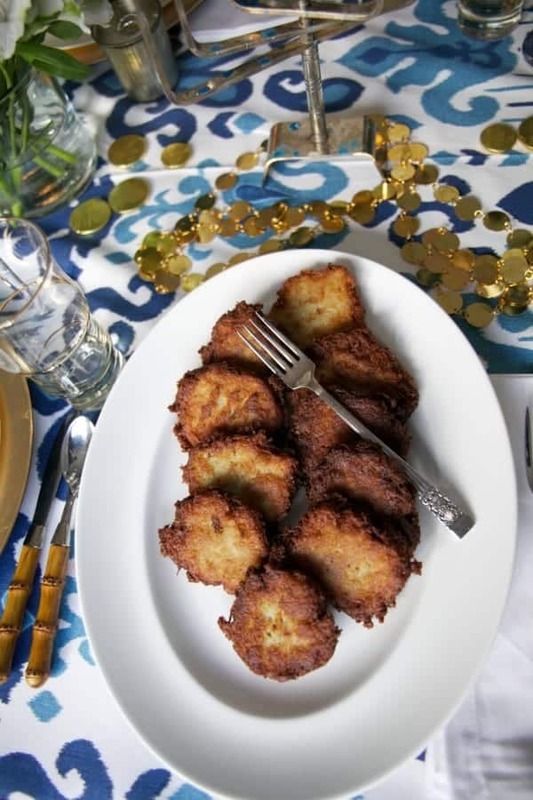 Papa Leo’s traditional potato latkes (pancakes) are the perfect dish to serve for Hanukkah or any day of the year! 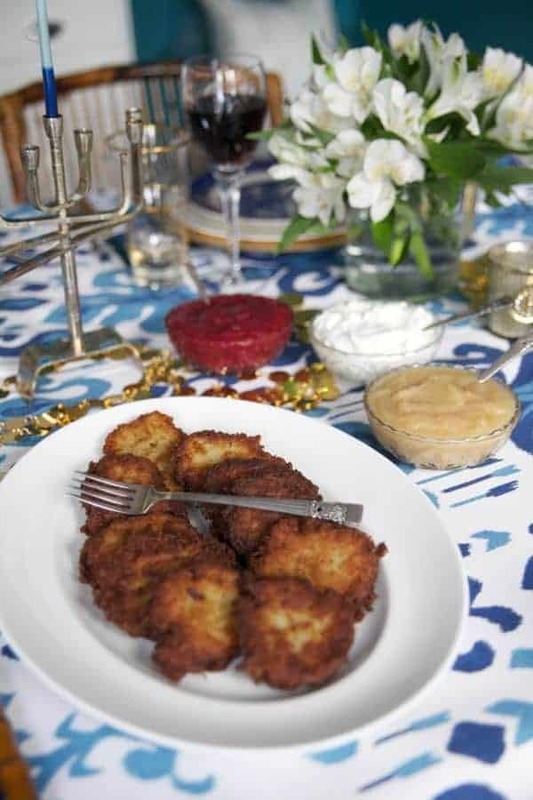 When Hanukkah rolls around every year, I have a hard time straying away from the traditional potato latke recipe passed down from my Papa Leo. Crispy, salty, savory potato pancakes in all their glory – it doesn’t get any better than this, folks. We top them simply with a little sour cream (or Greek yogurt) and apple sauce. That’s it. End of story. There is nothing else needed – this is your one way ticket to latke perfection. Using a food processor with the grading attachment to shred the potatoes and onions will save you time and prevent bloody knuckles. Trust me on this one. Squeeze out as much water as possible from the grated potatoes. Paper towel or a kitchen tower work really well. Keep squeezing until you can’t squeeze any more. Note: If using a food processor, do the potatoes separately from the onions so you can squeeze them. Onion juice = flavor. Potato water = soggy sadness. Make more than you think you’ll need. More than likely, you’ll only make these once a year. Go crazy and make a double batch. Your family will thank you. 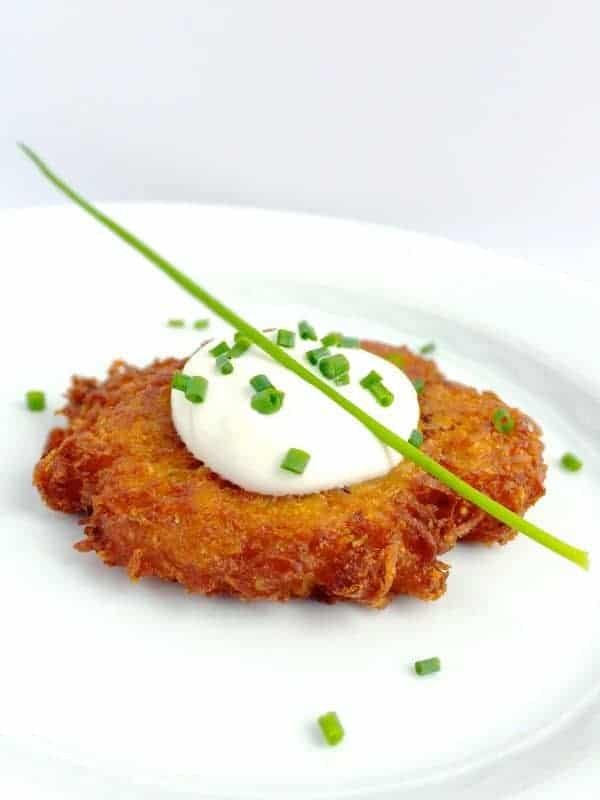 Papa Leo's traditional potato latkes (pancakes) are the perfect dish to serve for Hanukkah or any day of the year! Using a food processor or cheese grader, grate the potatoes and place in a bowl using a paper towel to remove excess water. Grate the onions then add to the potatoes. 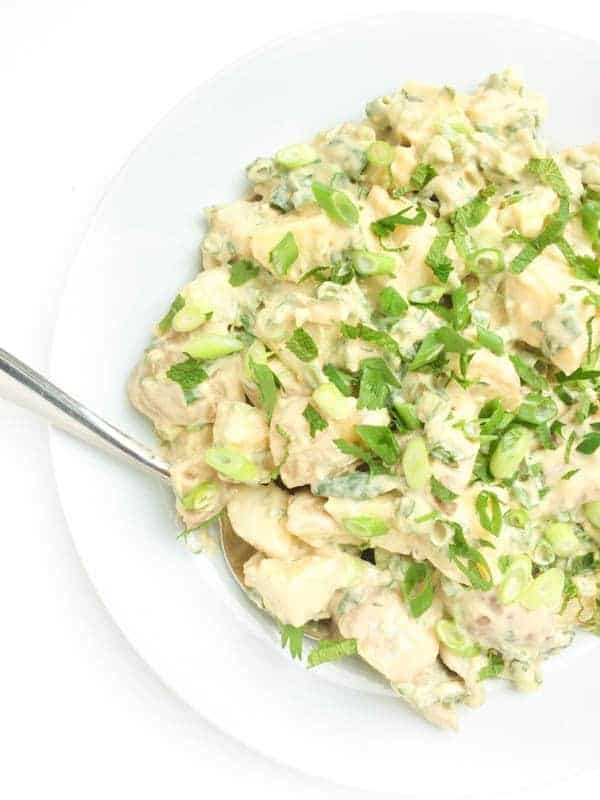 Add egg, salt and matzo meal to the potato/onion mixture and mix well with a fork. If mixture seems too watery, add more matzo meal. Heat 2-3 inches of oil over medium-high heat In a deep pan (or cast iron skillet). Add a drop of the potato mixture to test the heat of the oil. If it bubbles, it's ready! Using an ice cream scoop or large soup spoon, drop potato mixture in to the oil being careful not to over crowd the pan. Flatten the pancakes with a metal spatula to ensure even cooking. After 3-4 minutes, check for color and flip once browned on one side. Flatten again with the spatula and cook until browned on both sides. Lay cooked latkes on plate or baking sheet lined with paper towel to absorb excess oil. Continue working in batches until all of the potato mixture is gone. 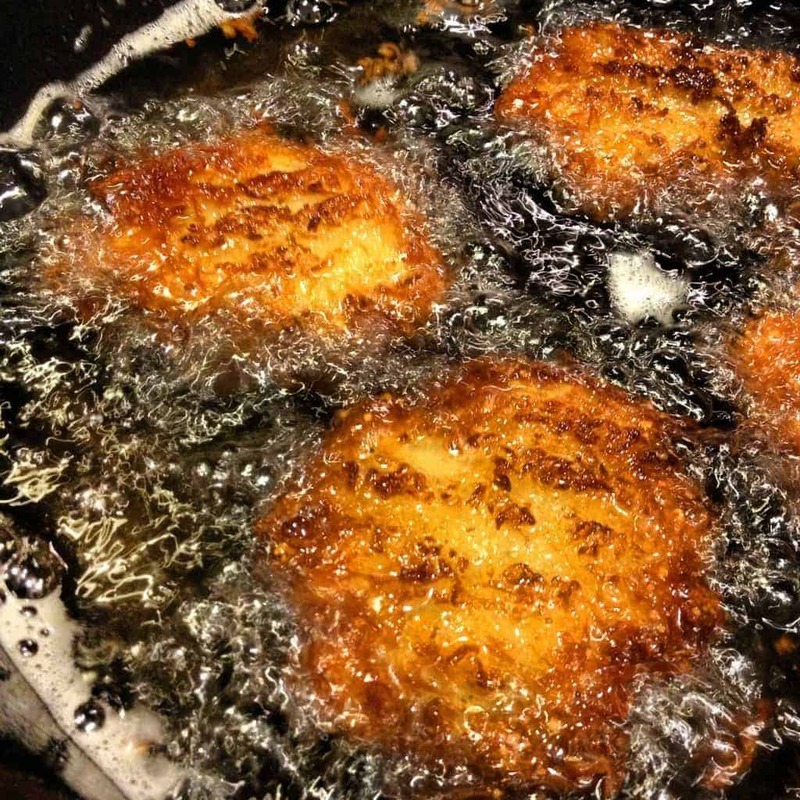 Keep potato latkes in oven heated to warm to keep hot until dinner is served. From someone who’s never made latkes…when you say 4 russet potatoes, how many pounds should I use? The sizes vary greatly! Thanks so much. i just love latkes! great recipe. 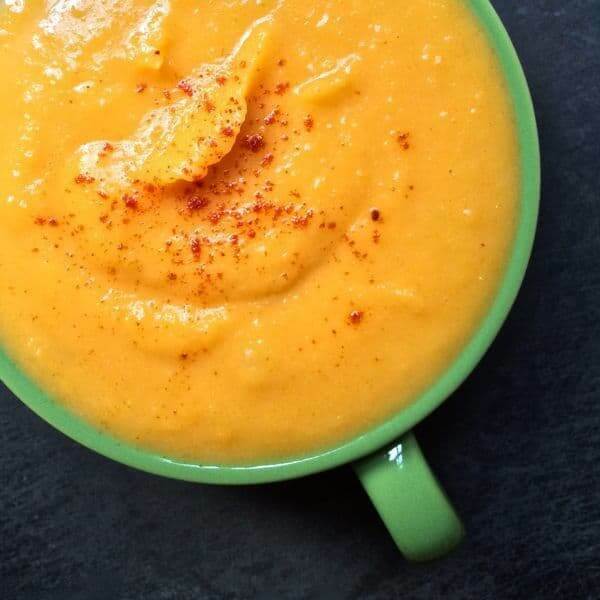 if u dont have a food processor, u can use a blender. growing up in a household of 9 many hands to help. in my late 20s my kids helped, then i got carpel tunnel in both hands and by 30 & 40’s just couldnt grate it anymore. plus my mom who is 25 years older than me, neither one of us good grate anymore :( well i didnt want to give up on this great food so i came up with a blender and tadah!! problem solved. home it helps for others. Good idea about the blender!!! Potato latkes and sufganiot… but the smell of fried food is permeating in our apartment. Aside from opening all the windows while frying, any other ideas to clear the air, lest the odor/aroma will linger long after Chanukah is gone… when I’ll need to start my diet! 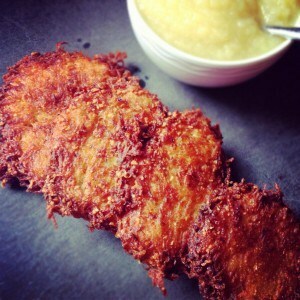 Oh, I love when my hubs makes latkes!!!! 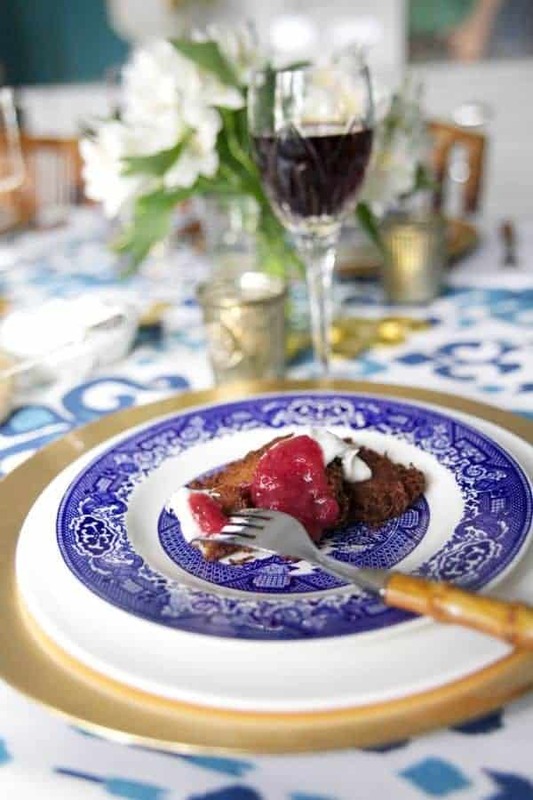 In fact, this will be in my tummy soon… thanks for the reminder! I hate to say it, but I wish McDonalds double cheeseburgers and fries had zero cals!! Yep. I just made a huge batch of latkes last night, happy chanukah to you. Any fried food lol I fall for em all. These are basically the latkes we made, although I made a quadruple batch. I freeze them and then serve them throughout the year. And although I don’t really like fried foods, I would be OK with these having no calories for my once a year dinner. Jelly doughnuts! Too many calories, but soo good! Lattes from Starbucks. They are my addiction.